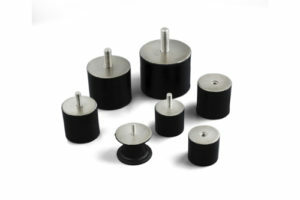 The AMC Mecanocaucho® Bobbins are devices for making elastic anchorings or fixings. 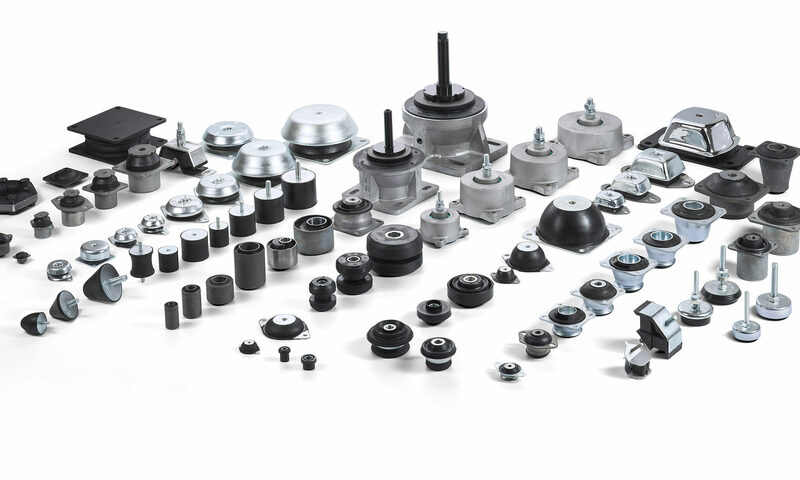 They can be used in a wide variety of applications, particularly for elastic suspensions and anti vibration isolation of machines and different mechanical organs. They are made of a block of rubber with two parallel metal parts at the end which enable it to be fixed either by screws in the ‘’C’’ model or with nuts in the ‘’A” model or a combination of both in the ‘’B” model. The rubber block may be cylindrical in cases requiring greater load capacity or as a diabolo when greater elasticity is required in all directions. Click here for the full Bobbin range. Depending on the size of the rubber block, the AMC Mecanocaucho® bobbing has more or less elasticity, which is greater particularly in all directions perpendicular to its axis (shear). The AMC Mecanocaucho® bobbing thus makes it possible to make joins which permit major relative movements, up to several millimetres (in the case of heat expansion, chassis deformations, etc.). The AMC Mecanocaucho® bobbing serves very well for the vibration isolation of machines where the vibrations are perpendicular to their axis, unless these stresses are too much when applied in this direction. The AMC Mecanocaucho® bobbins are particularly suitable for installation on small motor-pumps, motor-ventilators, driers, sieves, compactors, washing machines, electrical motors, on-board control panels, measuring apparatuses, control cabinets, microphones, fluorescent tubes, etc.